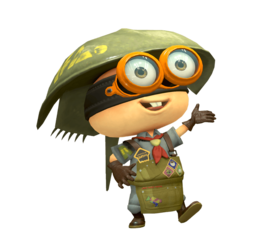 Sheldon (Japanese: ブキチ Bukichi) is the horseshoe crab who owns Ammo Knights, a weapons store in Inkopolis. Sheldon has brown eyes and 'buck' teeth, and because he is a horseshoe crab, Sheldon's helmet is the shell of that species of chelicerate. Sheldon wears a military jacket and military boots, as well as a red scarf and a red belt. Sheldon also has, what appears to be brass binoculars that he assumingly uses as glasses. Sheldon is a genuine military fanatic from a well-respected family who is fascinated with his weapons. He has developed nearsightedness due to staying up late every night tinkering with weapons and small parts, causing him to be rejected from the military for his extremely poor eyesight. Undaunted, he decided to start a business selling weapons out of his own home, and Booyah Base was eventually built on the same land upon which that home stood. However, it was not Sheldon but his grandfather, Ammoses Shellendorf, who owned the land. In Splatoon 2, he seems to have improved his skills in creating weapons as he is now able to create new versions of the Hero weapons as well as upgrade them with a machine he made as well. When the Hero Replicas are now available to be purchased, instead of saying he couldn't replicate the technology like in the first game, he says that the weapon wasn't able to be mass produced by "the guys at the factory". Sheldon's version of DJ Lee Fish's song Lookin' Fresh is more distant, showing his separation from the others as a weapons dealer. It also has static and other sounds reminiscent of a military radio, as a reference to his obsession with the military. Sheldon's name plays on the word shell: an ammunitions shell, and horseshoe crabs have large shells. Ammoses Shellendorf, Sheldon's grandfather (or Grandpappy as he calls him in the game), was part of the original Squidbeak Splatoon, led by Cap'n Cuttlefish. Sheldon appears to be missing 7 eyes, compared to real horseshoe crabs. It is possible that he is wearing something over his shell, which would hide the extra eyes. According to the first artbook Sheldon is the third generation owner of Ammo Knights. He also wanted to become a soldier but couldn't, since he became nearsighted by studying weapons up close. One of Callie and Marie's conversations in Octo Canyon ask whether if Sheldon is part of the New Squidbeak Splatoon or not. Marie says that he was invited but he says that the "tech team" has to keep its distance from the front lines; neither Callie or Marie know what this means. Render of Sheldon in Splatoon. Sheldon's reaction to the player not having enough Cash. Sheldon in his weapon shop, Ammo Knights. Official art of Sheldon, Annie, and Moe as a promo for Version 2.2.0. Sheldon's icon in Octo Canyon. Official art of Sheldon in Splatoon 2. Sheldon during the final boss of Splatoon 2. Hero Weapons modified by Sheldon‎. Italian Armand From arma (weapon) and armando, a male name. This page was last edited on 15 March 2019, at 13:59. This page has been accessed 60,353 times.